Dice your tomatoes and place into one bowl and mix the Cool Herb Topping Mix with 100ml soured cream in another. Next shred your lettuce and place into a third bowl. Keep all three in the fridge until needed. In a hot pan, add a splash of oil and start browning your 500 g of minced beef. Then drain off any excess liquid. Reduce the heat, add the Extra Mild Super Tasty Tomato Stir-In Sauce and stir well for 2 minutes. Add half of the grated cheese (50 g), stirring until the cheese has melted. 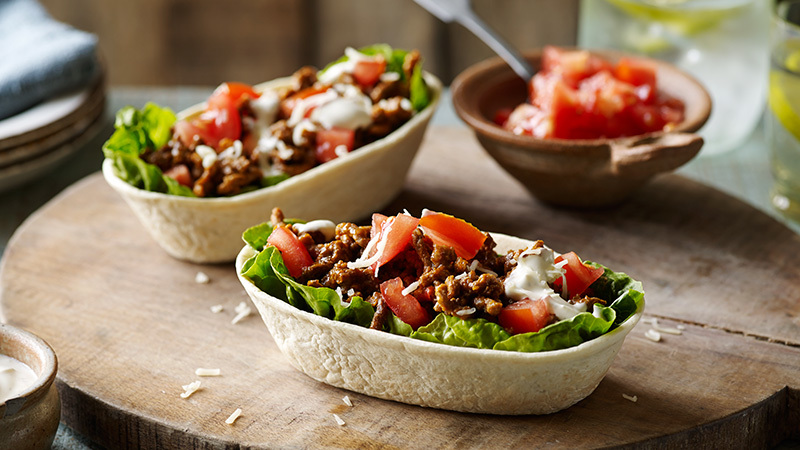 Fill your Stand ‘N’ Stuff™ Soft Flour Tortillas with your freshly cooked meaty filling and top with your freshly diced tomatoes, shredded lettuce, your Cool Herb Topping Mix and remaining grated cheese – then get stuck in!